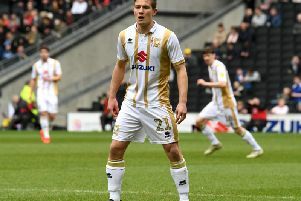 MK Dons will bid to make it three wins in a row on Saturday when they travel to the Abbey Stadium to take on Cambridge United. Joe Dunne’s side have struggled this season, and sit 23rd in the table with two wins to their name, while Dons have picked up back-to-back victories and are fourth. Despite Cambridge being without a league win since the start of September, they were comfortable 4-0 winners on Tuesday night against Southampton U21s, while Dons were beaten 3-0 by Luton, though have lost just once in League 2 this season. “Every week is an opportunity,” said Tisdale. “Cambridge will be a challenge. League 2 is a challenge, but we have got to make sure we play with the same focus we have done in the last three or four games. "I've always enjoyed going to Cambridge. It's a quite old fashioned ground, but done in a nice way. I know we're taking a lot of fans and that will be a huge boost for myself and the players. It's a local game, for all intents and purposes. I'm hoping it will be a good game of football there." Despite Cambridge's league position so far, Tisdale is wary not to underestimate them, as he continued: "My experience of League 2 over the years is that it is a really concertinaed league. By the time it gets stretched in November, December, you know the teams at the top who will be the tough nuts to crack. And I'd like to be in there. "Then, you've got 15 teams who on their day could provide a challenging game. I don't look at the league table and see a team in a certain position, it's not that quantifiable yet. Generally, it's an evenly matched league." Saturday’s game will be the first ever league meeting between the two sides, with the U’s coming out on top in a friendly at the Abbey Stadium in 2014. And it will be Rhys Healey's first experience of Cambridge too. He said: "I've never played in Cambridge before, but some of the lads have been telling me it's a nice, tight ground and the crowd will be up for it and I'm up for the challenge."